Identifying your customers is one thing, understanding them is another. Therapy Hubs allow you to do both. Specifically designed to assist life sciences, Therapy Hubs combine contact information with customer intelligence relating to those people and organisations involved in the awareness, referrals, treatment and prescribing within a specific therapy area. 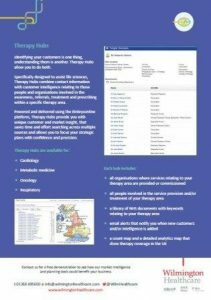 Powered and delivered using the Binleysonline platform, Therapy Hubs provide you with unique customer and market insight, that saves time and effort searching across multiple sources and allows you to focus your strategic plans with confidence and precision. Define your customer groups and set-up alerts for when new customer groups or people of interest are added. Documents include formularies, meeting minutes and business plans and come with built-in keyword saved searches to alert you when a new document relating to the therapy area is added.